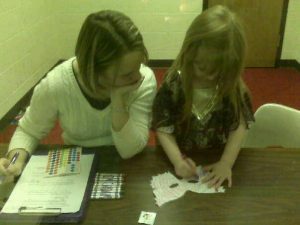 Moya at 4 years old in her second semester of speech therapy with her favorite clinician, Danielle. Moya’s ability to communicate grew leaps and bounds that year! I like to plan. I like to plan, and I like to make lists. Oh, I’m not really a super organized person by any stretch of the imagination. It’s just that planning and making lists helps me to feel like I’m trying to be organized. It also helps me to see beyond today and examine the future possible results of the choices I make. I wasn’t always like this. Despite some serious trials during my youth, as a young lady, I still had a carefree, fly-by-the-seat-of-your-pants lifestyle. I was certainly free spirited. This in-the-moment régime meant that I never fretted too much about how my decisions affected others. Sounds like I was a selfish person, but honestly, I was just immature. Being selfish was the furthest thing from my mind. I was always on the side of the underdog, spending most of my time trying to think of how to help someone else. Maybe that desire to help others blinded me to how my free spirited lifestyle and choices were affecting the people in my immediate circle. Then… I had kids. Being a parent changes everything, as many of you well know. Your daily and long term decisions impact the lives of your children in an undeniable and lasting way. Into that already hectic mix, add a child with Autism (or any other special need) and you find yourself suddenly paying very close attention to your actions. 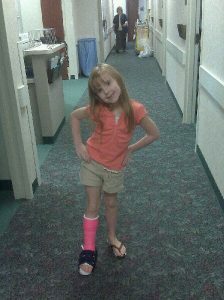 Moya leapt off of some stacked chairs and broke her ankle. Here she is at 6 years old taking it like a champ… for at least the first 3 hours. After that, having a cast became a little more difficult for this sensitive little girl. For the last twenty years in which my life has been filled with “…kids, kids and more kids…”, I have planned. Planning became crucial. Thinking ahead became key. Considering every decision’s outcome IS how I have lived-in-the-moment since becoming a mom. In particular, over the last nine years I have had to step up my planning game, because when our youngest child Moya was going on five we discovered that she is Autistic. I have had to adopt a new motto; Let the planning commence! Can my Autistic daughter adapt to her surroundings if we go here? Can she participate with the family if we go there? Reminders to myself to not forget to pack the ear plugs in case the sounds become too loud. Don’t forget a change of clothes in-case she gets too hot or something feels scratchy in the clothes she’s chosen to wear today (because if she had to endure scratchy or hot clothes all day, it could lead to a seriously emotional young lady and a very unpleasant family experience). Today I find myself staring at a beautiful thirteen-year-old Moya. She has been homeschooled, which provided her with a lot of one-on-one time. That has helped to boost her confidence and help her to move past some of her non-neurotypical behaviors, rather than forcing her to conform in a way that would damage her emotionally. Over time, the changes that she made were her choice. She still monologues loudly in the shower, has the occasional melt down, crams food in her mouth in unusually large bites, and struggles with finding the right words to use in a sentence. This can make things socially awkward for her at times. 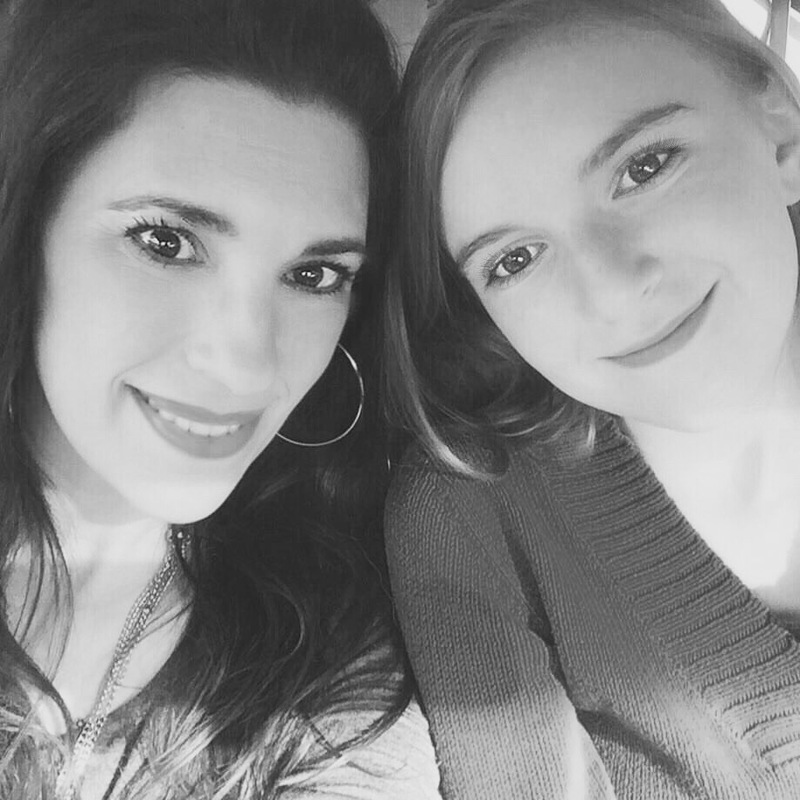 It’s all part of growing up with Autism, though, and so that’s ok.
On the other hand, Moya has grown into a young lady full of love, compassion, gentleness, and kindness. She gets along well with others. She is focused and gets her school work done. She goes to bed early of her own volition. She values routine, like many other children on the Autism spectrum do. She wants a future and she has a dream to do great things. So, guess what? I am planning. I am planning to put aside any fears I may have had because of Autism and I am choosing to dream with her about what the future could look like in her life. I’m her mom, so naturally I want the best for her. I want her to be happy and to feel loved. When it comes to preparing Moya for her future, I’m making a list. Here’s my plan. Myself and Moya. She is 13 now and we have no idea what the future holds… and that’s ok.
Monday: Believe the best and love unconditionally. Tuesday: Hope for the future and enjoy today. Wednesday: Give lots of encouragement and dream the impossible dream! Thursday: Teach her to love others and have lots of mercy. Friday: Don’t be too serious, but learn to have fun. Saturday: Don’t be fearful; be bold and take risks, believe miracles happen! Sunday: Love God first, and then yourself no matter what anyone else may say to you or about you. She’s has a bright future and a life filled with hope. Will things go as we plan? I have no idea, and that’s ok, as well.